Dragut (Turkish: Turgut Reis) (1485 – 23 June 1565), known as "The Drawn Sword of Islam", was a Muslim Ottoman naval commander, governor, and noble, of Greek descent. Under his command, the Ottoman Empire's maritime power was extended across North Africa. Recognized for his military genius, and as being among "the most dangerous" of corsairs, Dragut has been referred to as "the greatest pirate warrior of all time", "undoubtedly the most able of all the Turkish leaders", and "the uncrowned king of the Mediterranean". He was described by a French Admiral as "A living chart of the Mediterranean, skillful enough on land to be compared to the finest generals of the time. No one was more worthy than he to bear the name of king". In addition to serving as Admiral and Corsair in the Ottoman Empire's Navy under Suleiman the Magnificent, Dragut was also appointed Bey of Algiers and Djerba, Beylerbey of the Mediterranean, as well as Bey, and subsequently Pasha, of Tripoli. While serving as Pasha of Tripoli, Dragut constructed great feats in the city, making it one of the most impressive to behold along all the North African Coast. Dragut was born in Karatoprak near Bodrum, on the Aegean coast of Asia Minor, in the sub-district called Saravalos in the western tip of Bodrum peninsula (which is called Turgutreis in his honour today) or probably in the Karabağ village on the Aegean coast of Asia Minor. The religion of Dragut's parents and his religion at birth are currently disputed, though there is consensus that he was a Muslim throughout his entire adult life. At the age of 12 he was noticed by an Ottoman army commander for his extraordinary talent in using spears and arrows and was recruited by him. Under his support the young Turgut became a skilled sailor, an outstanding gunner, and was trained as a cannoneer and master of siege artillery, a skill which would play an important role in Turgut's future success and reputation as a superb naval tactician. The Ottoman Turkish governor eventually carried Turgut off to Egypt in 1517, where he participated in the Ottoman conquest of Egypt as a cannoneer. He further improved his skills in this field during his presence in Cairo. Following the death of his master, Turgut went to Alexandria and began his career as a sailor after joining the fleet of Sinan Pasha. He immediately became one of the favourite crewmen of the famous corsair due to his success in hitting enemy vessels with cannons. Turgut soon mastered the skills of seamanship and became the captain of a brigantine, while given 1/4 of its ownership. After several successful campaigns, he became the sole owner of the brigantine. Turgut later became the captain and owner of a galiot, and arming it with the most advanced cannons of that period, he started to operate in the Eastern Mediterranean, especially targeting the shipping routes between Venice and the Aegean islands belonging to the Repubblica Serenissima. In 1520, he joined the fleet of Hayreddin Barbarossa, who would become his protector and best friend. Turgut was soon promoted to the rank of Chief Lieutenant, by Barbarossa, and was given command of 12 galiot-class naval vessels. In 1526, Turgut Reis captured the fortress of Capo Passero in Sicily. Between 1526 and 1533 he landed several times at the ports of the Kingdom of Sicily and the Kingdom of Naples, while intercepting the ships which sailed between Spain and Italy, capturing many of them. In May 1533, commanding four fustas and 18 barques, Turgut Reis captured two Venetian galleys near the island of Aegina. In June and July 1538 he accompanied Barbarossa on his pursuit of Andrea Doria in the Adriatic Sea, while capturing several fortresses on the coasts of Albania as well as the Gulf of Preveza and the island of Lefkada. In August 1538 Turgut Reis captured Candia in Crete as well as several other Venetian possessions in the Aegean Sea. In September 1538, at the Battle of Preveza, Turgut Reis, with 20 galleys and 10 galiots, commanded the center-rear wing of the Ottoman fleet which defeated the Holy League, a short-lived Christian alliance consisting of the Knights of Malta, the Papal States, Venice, Spain, Naples and Sicily, who were then under the command of Andrea Doria. Despite the Holy League's vastly superior numbers of ships, 302, and soldiers, 60,000, Dragut and the Ottoman fleet dealt the Christian alliance a decisive defeat, with only 112 ships, and 12,000 soldiers. During the battle, with two of his galiots, Dragut captured the Papal galley under the command of Giambattista Dovizi, the knight who was also the abbot of Bibbiena, taking him and his crew as prisoners. In 1539, commanding 36 galleys and galiots, Turgut Reis recaptured Castelnuovo from the Venetians, who had taken the city back from the Ottomans. During the combat he sank two Venetian galleys and captured three others. Still in 1539, while landing on Corfu, he encountered 12 Venetian galleys under the command of Francesco Pasqualigo and captured the galley of Antonio da Canal. He later landed at Crete and fought against the Venetian cavalry forces under the command of Antonio Calbo. In early 1540 Turgut Reis captured several Genoese ships off the coast of Santa Margherita Ligure. In April 1540, commanding two galleys and 13 galiots, he landed at Gozo and sacked the island. He later landed at Pantelleria and raided the coasts of Sicily and Spain with a force of 25 ships, inflicting so much damage that Andrea Doria was ordered by Charles V to chase him with a force of 81 galleys. From there, Turgut Reis sailed to the Tyrrhenian Sea and bombarded the southern ports of Corsica, most notably Palasca. He later captured and sacked the nearby island of Capraia. Turgut Reis later sailed back towards Corsica and docked his ships at Girolata on the western shores of the island. Taken by surprise in the Battle of Girolata while repairing his ships, Turgut Reis and his men were attacked by the combined forces of Giannettino Doria (Andrea Doria's nephew), Giorgio Doria and Gentile Virginio Orsini. Turgut Reis was captured and was forced to work as a galley slave in the ship of Giannettino Doria for nearly four years before being imprisoned in Genoa. Barbarossa offered to pay ransom for his release but it was rejected. In 1544, when Barbarossa was returning from France with 210 ships sent by Sultan Suleiman to assist King Francis I in a Franco-Ottoman alliance against Spain, he appeared before Genoa, laying siege to the city and forcing the Genoese to negotiate for the release of Turgut Reis. Barbarossa was invited by Andrea Doria to discuss the issue in his palace at Fassolo, and the two admirals reached an agreement for the release of Turgut Reis in exchange of 3,500 gold ducats. Barbarossa gave Turgut his spare flagship and the command of several other vessels, and in that same year Turgut Reis landed at Bonifacio in Corsica and captured the city, inflicting particular damage to Genoese interests. Still in 1544 he assaulted the island of Gozo and fought against the forces of knight Giovanni Ximenes while capturing several Maltese ships which were bringing precious cargo from Sicily. In June 1545 he raided the coasts of Sicily and bombarded several ports on the Tyrrhenian Sea. In July he ravaged the island of Capraia and landed at the coasts of Liguria and the Italian Riviera with a force of 15 galleys and fustas. He sacked Monterosso and Corniglia, and later landed at Manarola and Riomaggiore. In the following days he landed at the Gulf of La Spezia and captured Rapallo, Pegli and Levanto. In 1546 he captured Mahdia, Sfax, Sousse and Al-Munastir in Tunisia, afterwards using Mahdia as a base to assault the Knights of St. John in Malta. In April 1546 he raided the coasts of Liguria. In May, still in Liguria, he captured Laigueglia, a province of Savona, with a force of 1000 men. He later captured Andora and took the podestà of the town as a prisoner. There he and his troops rested for a brief period, before resuming their assault on the Italian Riviera and landing at San Lorenzo al Mare. He also destroyed the village of Civezza. From there he once again sailed towards Malta and laid siege to the island of Gozo. Bust of Turgut Reis in the Mersin Naval Museum. After Barbarossa's death in July 1546, Turgut succeeded him as supreme commander of Ottoman naval forces in the Mediterranean. In July 1547 he once again assaulted Malta with a force of 23 galleys and galiots, after hearing the news that the Kingdom of Naples was shaken by the revolt against Viceroy Don Pietro of Toledo, which would make a naval support from there to Malta rather unlikely. Turgut Reis landed his troops at Marsa Scirocco, the extreme southern point of the island which faces the shores of Africa. From there the Ottoman troops quickly marched towards the vicinity of the Church of Santa Caterina. The guards of the church tower escaped as soon as they saw the forces of Turgut Reis, which prevented them from igniting the tub of gunpowder—a common method used then to warn the local inhabitants of attacks. After sacking the island, Turgut Reis headed towards Capo Passero in Sicily, where he captured the galley of Giulio Cicala, son of Duke Vincenzo Cicala. He later sailed to the Aeolian Islands, and at Salina Island he captured a Maltese trade ship with valuable cargo. From there he sailed to Apulia and towards the end of July 1547 he assaulted the city of Salve. He later sailed to Calabria, forcing the local population to flee towards the safety of the mountains. From there he went to Corsica and captured a number of ships. In 1548 he was appointed Beylerbeyi (Chief Governor) of Algeria by Suleiman the Magnificent. In that same year he ordered the construction of a quadrireme galley at the naval arsenal of Djerba, which he started using in 1549. In August 1548 he landed at Castellamare di Stabia on the Bay of Naples and captured the city along with nearby Pozzuoli. From there he went to Procida. A few days later, he captured a Spanish galley loaded with troops and gold at Capo Miseno near Procida. In the same days he captured the Maltese galley, La Caterinetta, at the Gulf of Naples, with its cargo of 70,000 gold ducats which were collected by the Knights of St. John from the churches of France with the aim of strengthening the defenses of Tripoli, which was then under Maltese control. In February 1550, sailing with a force of 36 galleys, he recaptured Mahdia along with Al Munastir, Sousse and most of Tunisia. In May 1550 he assaulted the ports of Sardinia and Spain and landed on their coasts with a force of six galleys and 14 galiots. Still in May he unsuccessfully tried to capture Bonifacio in Corsica. On his way back to Tunisia, he stopped at Gozo to replenish his ships with water and to gather information on the activities of the Maltese Knights. He later sailed towards Liguria. In September 1550 Mahdia surrendered to the joint Spanish-Sicilian-Maltese force. In the meantime, Turgut Reis was repairing his ships at the beach of Djerba. On October, Andrea Doria appeared with his fleet at Djerba and blocked the entrance of the island's lagoon with his ships, trapping the beached galleys of Turgut Reis inside the Channel of Cantera. Turgut Reis had all his ships dragged overland through hastily dug canals and on a heavily greased boardway to the other side of the island and sailed to Constantinople, capturing two galleys on the way, one Genoese and one Sicilian, which were en route to Djerba in order to assist the forces of Doria. Prince Abu Beker, son of the Sultan of Tunis, who was an ally of Spain, was on the Genoese galley. Turgut Reis landing on Malta by Eugenio Caxes. After arriving in Constantinople, Turgut Reis, under mandate by Sultan Suleiman, mobilized a fleet of 112 galleys and two galleasses with 12,000 Janissaries, and in 1551 set sail with the Ottoman admiral Sinan Pasha towards the Adriatic Sea and bombarded the Venetian ports, inflicting serious damage on Venetian shipping. In May 1551 they landed on Sicily and bombarded the eastern shores of the island, most notably the city of Augusta, as revenge for the Viceroy of Sicily's role in the invasion and destruction of Mahdia, where most inhabitants had been massacred by the joint Spanish-Sicilian-Maltese force. They then attempted to capture Malta, landing with about 10,000 men at the southern port of Marsa Muscietto. They laid siege to the citadels of Birgu and Senglea, and later went north and assaulted Mdina, but lifted the siege after realizing that it was impossible to capture the island with the number of troops in hand. Instead, they moved to the neighboring island of Gozo, where they bombarded the citadel for several days. The Knights' governor there, Galatian de Sesse, realizing that resistance was futile, surrendered the citadel, and the corsairs sacked the town. Taking virtually the entire population of Gozo (approximately 5,000 people) into captivity, Turgut and Sinan set sail from the port of Mġarr ix-Xini in Gozo and headed towards Libya, where they shipped the captives to Tarhuna Wa Msalata. They later sailed towards Tripoli with the aim of conquering the strategic port city and its environs. Historic map of Tripoli by Piri Reis. 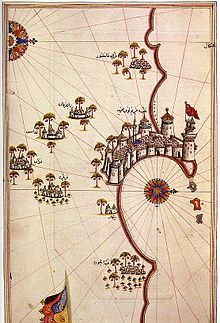 In August 1551 Turgut Reis attacked and captured Tripoli (Ottoman Tripolitania, modern Libya) which had been a possession of the Knights of St. John since 1530. Gaspare de Villers, the commander of the fort, was captured, along with other prominent knights of Spanish and French origin. However, upon the intervention of the French ambassador in Constantinople, Gabriel d'Aramon, the French knights were released. A local leader, Ağa Murat, was initially installed as governor of Tripoli, but subsequently Turgut himself took control of the area. In recognition of his services, Sultan Suleiman awarded Tripoli and the surrounding territory to Turgut, along with the title of Sanjak Bey ("Lord of the Standard"). In September 1551, Turgut Reis sailed to Liguria and captured the city of Taggia, before capturing other ports of the Italian Riviera, after Ottoman troops landed at the beach of Riva Trigoso. Later that year, he returned to Tripoli and sought to extend his territory, capturing the entire region of Misrata all the way to Zuwara and Djerba to the west. Turning inland, he enhanced his territory until reaching Gebel. In 1552 Sultan Suleiman appointed Turgut Reis commander-in-chief of the Ottoman fleet which he dispatched to Italy (on the basis of a treaty between the Sultan and King Henry II of France). Turgut Reis first landed at Augusta and Licata in Sicily, before capturing the island and castle of Pantelleria. In July 1552 he landed at Taormina and later bombarded and disabled the ports on the Gulf of Policastro. He later landed at Palmi and captured the city, before sailing to the Gulf of Naples in order to meet with the other branch of the Ottoman fleet under the command of Sinan Pasha and the French fleet under the command of Polin de la Garde. After arriving at the meeting location, Turgut Reis anchored his ships off the beach of Scauri, near Formia, where he met with the fleet of Sinan Pasha, but their French ally did not show up in time. After waiting for several days, Sinan Pasha decided to return to Constantinople, following an order by Suleiman to do so in case of a delay or postponement of the meeting. Turgut Reis convinced Sinan Pasha to join him, and their combined fleet bombarded various ports of Sardinia and Corsica, before capturing the island of Ponza. From there, the Turkish fleet sailed towards Lazio and bombarded the ports belonging to the Papal States and the Kingdom of Naples, even though Henry II had guaranteed the Pope that the Ottoman fleet would not damage the Vatican's possessions. Due to bad weather, however, Turgut Reis and Sinan Pasha sailed back to the Gulf of Naples and landed at Massa Lubrense and Sorrento, capturing both towns. They later captured Pozzuoli and the entire coastline up to Minturno and Nola. In response, Andrea Doria set sail from Genoa with a force of 40 galleys and headed towards Naples. When the two fleets first encountered off Naples, Turgut Reis managed to capture seven galleys, with colonel Madruzzi and many German soldiers of the Holy Roman Empire on board. The two fleets later went southwards, where, on 5 August 1552, Turgut Reis defeated the Spanish-Italian fleet under Andrea Doria at the Battle of Ponza. Following this victory, Suleiman appointed Turgut Beylerbeyi (Chief Regional Governor) of the Mediterranean Sea. In May 1553 Turgut Reis set sail from the Aegean Sea with 60 galleys, captured Crotone and Castello in Calabria, and from there marched inland. Later he landed on Sicily and sacked most of the island until stopping at Licata for replenishing his ships with water. Afterwards he assaulted Sciacca and Modica in southern Sicily. From there he went to the island of Tavolara and to Sardinia, later headed towards Porto Ercole and landed on the coast, before setting sail towards Elba, where he captured Marciana Marina, Rio and Capoliveri. From there he sailed to Corsica and took Bonifacio and Bastia on behalf of France, then ally of the Ottoman Empire, which paid him 30,000 gold ducats for the expense of ammunition in the conquest. Leaving Corsica, Turgut Reis returned to Elba and attempted to capture Piombino and Portoferraio, but eventually gave up and captured the island of Pianosa and recaptured the island and castle of Capri (previously captured by Barbarossa back in 1535) before returning to Constantinople. The following year, in July 1555, he landed at Capo Vaticano in Calabria, and from there marched to Ceramica and San Lucido, bombarding these cities, before capturing Paola and Santo Noceto. He then sailed to Elba and captured the city of Populonia before assaulting Piombino. From there he sailed to Corsica and ransacked Bastia, taking 6000 prisoners. He later assaulted Calvi before setting sail towards Sardinia and bombarding the ports of that island. From there he turned towards Liguria and landed at Ospedaletti, capturing the city and the coastline around it. He later landed at San Remo before returning to Constantinople. In March 1556, Turgut Reis was appointed Pasha of Tripoli. There, he strengthened the walls of the citadel surrounding the city and built a gunpowder bastion (Dar el Barud). He also strengthened the defenses of the port and built the Turgut (Dragut) Fortress in place of the old Fortress of San Pietro. In July 1556 he again set sail and landed at Cape Santa Maria at the island of Lampedusa, where he captured a Venetian ship which transported ammunition and weapons for the defense of Malta. He later landed in Liguria and captured Bergeggi and San Lorenzo. In December 1556 he captured Gafsa in Tunisia and added it to his territory. In 1558 he added Gharyan, about 70 miles south of Tripoli, to his territory. He then defeated the Beni Oulid dynasty with a force of janissaries and added their territories to the Ottoman Empire. He later took Taorga, Misrata and Tagiora, before recapturing the island of Djerba and adding it to his province. In June 1558 he joined the fleet of Piyale Pasha at the Strait of Messina, and the two admirals captured Reggio Calabria, sacking the city. From there, Turgut Reis went to the Aeolian Islands and captured several of them, before landing at Amalfi, in the Gulf of Salerno, and capturing Massa Lubrense, Cantone and Sorrento. He later landed at Torre del Greco, the coasts of Tuscany, and Piombino. In August he captured several ships off Malta. In September 1558 he joined Piyale Pasha, and the two admirals assaulted the coasts of Spain before capturing Ciutadella (Menorca) and inflicting particular damage on the island's ports. The aftermath of the Battle of Djerba resulted in the alleged construction of a tower of skulls from the remains of the fallen. In the meantime, Dragut had made enemies of many of the nominally Ottoman, but practically independent rulers in Tunis and the adjoining hinterland, and several of them entered into an alliance in 1560 with Viceroy Cerda of Sicily, who had orders from King Philip II of Spain to join his forces in an effort to capture Tripoli. Philip II's efforts ended in failure when the Ottoman fleet of 86 ships, under the command of Piyale Pasha and Turgut Reis, decisively defeated the fleet of the Christian alliance of Philip II, consisting of 200 ships, at the Battle of Djerba. In 1563 he landed at the shores of the province of Granada and captured coastal settlements in the area like Almuñécar, along with 4,000 prisoners. He later landed at Málaga. In April 1563 he supported the fleet of Salih Reis with 20 galleys during the Ottoman siege of Oran, bombarding the Fortress of Mers-el-Kebir. In September 1563, Dragut sailed to Naples and captured six ships near the island of Capri, which carried valuable goods and Spanish soldiers. He later landed at the Chiaia neighbourhood of Naples and captured it. From there he sailed to Liguria and Sardinia, raiding the coastal towns, particularly Oristano, Marcellino and Ercolento. He then sailed to the Adriatic Sea and landed on the coasts of Apulia and Abruzzo. He later landed twice at San Giovanni near Messina with a force of 28 galleys. In October 1563 he sailed towards Capo Passero in Sicily and later landed once more on Gozo, where he briefly fought against the knights. Artists impression of the Mirrored armour worn by Dragut. Death of Dragut by Giuseppe Calì. When Sultan Suleiman ordered the Great Siege of Malta in 1565, Turgut Reis joined Piyale Pasha and the Ottoman forces with 1,600 men (3,000 according to some sources) and 15 ships (13 galleys and 2 galiots; while some sources mention 17 ships) on 31 May 1565. He landed his troops at the entrance of Marsa Muscietto, a cape which is now named 'Dragut Point' after Turgut Reis. It was there where Dragut met with Kızılahmedli Mustafa Pasha, commander of the Ottoman land forces, who was besieging Fort St. Elmo. He advised him to first capture the poorly defended Cittadella and Mdina as soon as possible, but this advice was not taken. He also arranged for more cannon fire to be concentrated on the recently built Fort St. Elmo which controlled the entrance of the Grand Harbour and seemed weaker than the other forts; joining the bombardment with 30 of his own cannon. In only 24 hours the Ottomans fired 6000 cannon shots. Realizing that Fort St. Elmo and Fort St. Angelo (the main headquarters of the Knights on the other side of the Grand Harbour) could still communicate with each other, Turgut Reis ordered a complete siege of Fort St. Elmo with the aim of isolating it from Fort St. Angelo. On 17 June 1565, Dragut was mortally injured when he was hit by splinters from a cannonball which hit the ground close to his position. It is not clear if the shot was fired from Fort St. Angelo, or if he was hit by friendly fire from a Turkish battery. Turgut succumbed to his wounds and died on 23 June 1565. Various Spanish and Italian historians such as Francisco Balbi di Correggio record the eventual defeat of Dragut's forces, after his death, in Malta. Many historians believe that, had he lived, the siege would have succeeded. His death, however, prompted squabbling between the two senior Ottoman military officers, which led, in turn, to a series of disastrous decisions that helped save the knights. His body was taken to Tripoli by Uluç Ali Reis, and buried in the Dragut mosque, situated behind the castle. The mosque is still in use today. F-241 TCG Turgut Reis, a Yavuz class (MEKO 200 TN Track I) frigate of the Turkish Navy, in Cartagena, Spain. The Ottoman battleship Turgut Reis. Dragut is depicted in many works of art, statues, and many books have been written about his life and conquests. Points of interest and buildings in multiple countries have been named after his native Turkish name of Turgut Reis. The town where he was born now bears his name, being renamed from Karatoprak in his honor, in 1972. Warships of the Turkish Navy, and passenger ships have been named after Turgut Reis. Turgut Reis continues to enjoy great fame and respect in Turkey, where the town of his birth is named Turgutreis. The end of the Tigne promontory in Malta is called Dragut Point, where Turgut established his first battery for the bombardment of Fort Saint Elmo in 1565. Dragut is considered a nemesis in Maltese history, and "il-Ponta ta' Dragut" serves as a memorial to the great battles that were fought there and the ultimate defeat of Dragut at the Great Siege of Malta. Rafael Sabatini's story "The Sword of Islam" was published in Premier magazine, August 1914. David W. Ball's novel Ironfire (Bantam Dell 2004, published as The Sword and the Scimitar in the U.K., and in two parts as Haç ve Hilal - Savrulan Yürekler and Haç ve Hilal - Kavuşan Yürekler, Istanbul, 2005). This novel of the 16th Century Mediterranean includes details of the life of Dragut from the Battle of Djerba to the Siege of Malta. The Course of Fortune by Tony Rothman (J. Boylston 2015, in three volumes). In this novel, which follows the adventures of a young Spaniard throughout the contest between the Turks and Christians to control the Mediterranean, Dragut is portrayed as a clever and ruthless adversary from his enslavement of the population of Gozo in 1551, through the Djerba campaign in 1560 and finally to the Siege of Malta in 1565. The Disorderly Knights and Pawn in Frankincense by Dorothy Dunnett both feature Dragut Rais as part of the 6-book series The Lymond Chronicles following fictional character Francis Crawford of Lymond. Civilization V features Turgut Reis as a Great Admiral. ^ Rafael Sabatini (2008). The Sword of Islam and Other Tales of Adventure. Wildside Press. p. 7. ISBN 9781434467904. Ordinarily Dragut Reis — who was dubbed by the Faithful "The Drawn Sword of Islam"
^ a b E. Hamilton Currey (2008). Flag of the Prophet: The Story of the Muslim Corsairs. Fireship Press. p. 168. ISBN 9781934757550. Brantome, that Dragut was born at a small village in Asia Minor called Charabulac, opposite to the island of Rhodes, and that his parents were Mahommedans. ^ a b Reynolds, Clark G. (1974). Command of the sea: the history and strategy of maritime empires. Morrow. pp. 120–121. ISBN 9780688002671. Ottomans extended their western maritime frontier across North Africa under the naval command of another Greek Moslem, Torghoud (or Dragut), who succeeded Barbarossa upon the latter's death in 1546. ^ Naylor, Phillip Chiviges (2009). North Africa: a history from antiquity to the present. University of Texas Press. pp. 120–121. ISBN 9780292719224. One of the most famous corsairs was Turghut (Dragut) (?–1565), who was of Greek ancestry and a protégé of Khayr al-Din. He participated in the successful Ottoman assault on Tripoli in 1551 against the Knights of St. John of Malta. ^ a b c Balbi, Francesco (2011). The Siege of Malta, 1565. Boydell Press. pp. 63–64. ISBN 9781843831402. ^ Braudel, Fernand (1995). The Mediterranean and the Mediterranean world in the age of Philip II, Volume 2. University of California Press. pp. 908–909. ISBN 9780520203303. Of all the corsairs who preyed on Sicilian wheat, Dragut (Turghut) was the most dangerous. A Greek by birth, he was now about fifty years old and behind him lay a long and adventurous career including four years in the Genoese galleys. ^ a b Judith Miller (1986-09-28). "Malta, Where Suleiman Laid Siege". The New York Times. Retrieved 2017-01-29. The Arabs were the first to build a fortress, which the knights improved upon. You can visit the prison that housed prisoners during World War II, and, some say, Turkish prisoners during the Great Siege. This fort has a splendid small chapel, St. Anne's, dating from 1430. There is one marble pillar in the center, the site of the ancient temples. To the west of Valletta, separated from the city by Marsamxett Harbor, is another site of the siege, Dragut Point. A Holiday Inn is now being built on this point, and one hopes its owners will commemorate at least with a plaque the spot where the greatest pirate warrior of all time fell. Dragut Reis was respected as the best Moslem seaman of his era, a true pirate, Governor of Tripoli and a military genius. Many historians believe that, had he lived, the siege would have succeeded. His death, however, prompted squabbling between the two senior Ottoman military officers, which led, in turn, to a series of disastrous decisions that helped save the knights. It was on this point, where tourists now sunbathe and the Maltese fish, that Dragut was mortally wounded before the fall of St. Elmo when a fragment of rock thrown up by a cannonball struck his head. He would have died instantly had it not been for his thick turban. Death came days later in his tent, shortly after he received news from a messenger that St. Elmo had fallen at last. ^ Balbi, Francesco (2011). The Siege of Malta, 1565. Boydell Press. pp. 63–64. ISBN 9781843831402. Born in 1485, he was eighty years old when he came to Malta for the siege. He had been a lieutenant under the famous Barbarossa and, on the latter's death, Dragut became the uncrowned king of the Mediterranean. He was known to his fellow Moslems as 'The Drawn Sword of Islam'. Although in his earlier career he had been at variance with the Sultan Suleiman, the latter had recently recognized Dragut's abilities by confirming him Governor of Tripoli. He knew the Maltese archipelago very well, having raided both islands on several occasions. Among his many successes against the Christians was his capture of Bastia in Corsica (when he had carried off seven thousand captives) and of Reggio in Italy (when he enslaved the whole population of the city). It was Dragut who had captured Tripoli from the Knights of St John in 1551. An old adversary of La Valette, he was undoubtedly the most able of all the Turkish leaders. He was described by a French admiral as 'A living chart of the Mediterranean, skillful enough on land to be compared to the finest generals of the time. No one was more worthy than he to bear the name of king'. ^ Naylor, Phillip Chiviges (2009). North Africa: a history from antiquity to the present. University of Texas Press. pp. 120–121. ISBN 9780292719224. One of the most famous corsairs was Turghut (Dragut) (?–1565), who was of Greek ancestry and a protégé of Khayr al-Din. ... While pasha, he built up Tripoli and adorned it, making it one of the most impressive cities along the North African littoral. ^ Yemişçi, Cihan (2013). Turgut Reis Turkish Maritime History Symposium (PDF) (in Turkish). Bodrum Agency Publishing Group. p. 31. ISBN 978-605-64005-1-3. ^ Yemişçi, Cihan (2011). Turgut Reis'in Nereli Olduğu Meselesi "The Question of Turgut Reis' Birth Place. I. Turgut Reis Turkish Maritime History Symposium (27–28 May 2011). Although there is no historical record to which village Turgut Reis was born in Saravalos, region folks in an agreement point to us Karabağ, which strikes our attention as no village other than here has any claim on the issue and the fact that the narrative story that is recited since the 1700s about how Turgut Reis sailed to seas the first time in his life also directs us to this village, brings out the conclusion that Turgut Reis was from the Karabağ village of Turgut Reis sub-district. ^ Lane-Poole, Stanley (1890). The Story of the Nations: The Barbary Corsairs. G.P. Gutnam's Sons. p. 124. The name of Dragut has already occurred more than once in this history: it was destined to become as notorious as Barbarossa’s as the century advanced. Dragut or Torghoud was born on the Caramanian coast opposite the island of Rhodes. Unlike many of his colleagues he seems to have been the son of Mohammedan parents, tillers of the earth. Being adventurous by nature, he took service as a boy in the Turkish fleet and became “a good pilot and a most excellent gunner.” At last he contrived to purchase and man a galleot, with which he cruised the waters of the Levant, where his intimate acquaintance with all the coasts and islands enabled him to seize and dispose of many prizes. ^ Lewis, Dominic Bevan Wyndham (1931). Charles of Europe. Coward-McCann. pp. 174–175. OCLC 485792029. A new star was now rising in the piratical firmament, Barbarossa's lieutenant Dragut-Reis, a Greek who had been taken prisoner by the corsairs in his youth and had turned Mahometan. ^ Beeching Jack (1983). The galleys at Lepanto: Jack Beeching. Scribner. pp. 72–73. ISBN 9780684179186. a Turkish governor took a fancy to the boy and carried him off to Egypt. ^ Jamieson, Alan G. (2013-02-15). Lords of the Sea: A History of the Barbary Corsairs. Reaktion Books. ISBN 9781861899460. ^ "Pirates All – Barbarossa, His Brothers and Their Successors | World History". worldhistory.us. Retrieved 2017-12-08. ^ "Science Source - Turgut Reis, Ottoman Admiral and Privateer". www.sciencesource.com. Retrieved 2017-12-08. ^ Carabott, Sarah (3 October 2015). "Fascinating new insights into Great Siege legends". Times of Malta. Archived from the original on 3 October 2015. ^ "The Great Siege - 1565". visitmalta.com. Retrieved 3 March 2015. ^ John Oakes (2011). Libya: The History of Gaddafi's Pariah State. The History Press. p. 38. ISBN 9780752471082. Dragut was killed on Saturday 23 June 1565, in the great battle between the Ottomans and the Hospitallers of St. John in Malta. His body was shipped to Tripoli and buried in the Dragut mosque situationed behind the castle. The mosque is still in use today.